Professional-quality knee brace with metal support stabilizes weak, aching or injured knees. Metal supports on each side hinge to protect and support the knee while allowing full mobility. Cutout knee design with adjustable straps provide breathable, customized compression. Knee support brace opens flat for easy on/off motion. 70% neoprene/20% nylon/10% iron. Spot clean. I like these braces because they are comfortable. I also like that my knees are free. The braces are good in keeping my joints and tendons straight. Less pain. This is my 2nd knee support. I use them on days that my knees need extra support. It works to keep your knee stable (side to side). But it keeps sliding down. Material arould the leg is thin and cheap, feels almost like felt. Perhaps it should have been made with a second strap at the top for more stability. I guess you get what you pay for. I have an update on this product. Had to send them back because they were too big for my knees and wouldn't stay where they were suppose to. My legs are not skinny by a long shot but these just did not work for me. They wouldn't stay in place. I ordered this for my neighbor-he did the research. Appeared to be easy on and off. will this help hyperextension of the knee? BEST ANSWER: Thank you for your question. We suggest checking with your local physician to make sure you get the proper brace for your needs. We hope this information will be of help to you. will this help hyperextension of knee? BEST ANSWER: Thank you for your question. 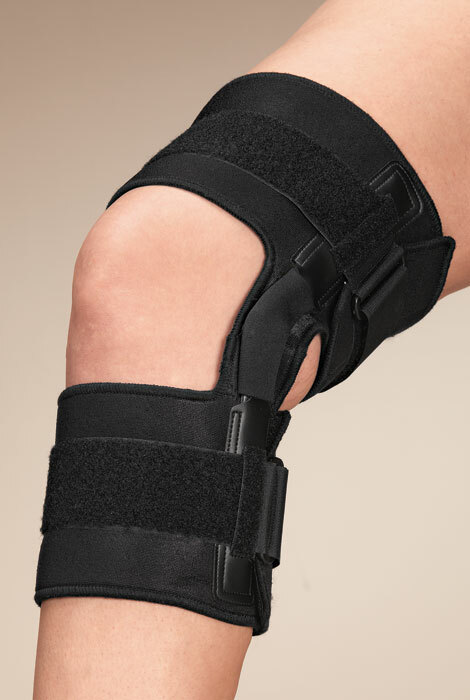 We suggest that you contact your local physician to get the best knee brace for your needs. We hope this information will be of help to you.